Hello everyone. I was able to get a pretty good take here from my response to the questions I posed about mobile marketing last week. Of course you'll hear my radar detector in the middle, but that's what I get for filming these in the car. Anywho, I'd love to hear your thoughts on the mobile topic. Thanks! 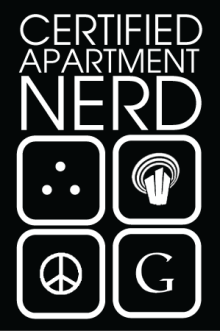 The Apartment Nerd (Episode 3.5) from Mark Juleen on Vimeo. On the topic of mobile, my unique experience in both the mobile texting and mobile internet space has led me to be a true believer in the potential of mobile marketing because it meets the instant gratification needs of gen X and Y. A significant amount of interest in communities comes from drive by or off-location traffic, which creates a tremendous opportunity for mobile marketing to enter the scene. How often will a potential resident remember THAT community when they get home, and take action later? When someone sees an advertisement that triggers interest in your community, the most convenient next step is to use your cell phone to gather further information—it’s always there. But making a phone call doesn’t always make sense... nobody wants to call, leave a message, wait for a call back, and then write information down on a piece of paper. Generation X and Y’ers (ages 18-40) in particular expect information to be readily accessible to them 24/7. Go with me on this for a second here and pretend that a cell phone is a lot like your remote control to the TV. When you use that remote control to change the channel, you expect it to work, right? The same goes for cell phones, and soon mobile users will expect to walk around and access content (change the channel) anytime and anywhere with their cell phone on-demand by texting a “KEYWORD” or visiting a user friendly mobile site. The more opportunities you give future residents to access content with a mobile phone, the more you are going to connect with these tech savvy residents. The easiest way to discover content on a phone is text messaging—every phone supports it and the experience can be easily controlled, unlike mobile internet. Statistically speaking, Nielson Company reported in 2008 that mobile users from ages 12-65 as a whole are texting on average more than calling, 204 calls vs. 357 texts each month. Combining mobile texting with mobile internet is a MUST. You can’t predict the type of phone that your future residents are using, so the best fit is to start with the basics (text messaging) and allow capable mobile phones to advance further into other areas such as mobile internet and mobile video. At IRIO Mobile Marketing, we’ve seen a growing number of customers come to us for mobile marketing services, including industry leaders like Riverstone and Campus Apartments, to name just a couple. We’re seeing substantial success in driving leads of prospective future residents to communities using our service—many of our communities see in excess of 20 leads per month, and a significant number see a great many more. We’ve also developed a back-end that allows our client communities to track these leads, book appointments, and ultimately close the sale. Based on our customers that continue to sign up more of their communities for more of our services, mobile marketing—done well and with a great customer experience—seems to be resonating within the industry. John, thanks for stopping by and commenting. I appreciate you adding the statistics regarding texts. The X and Y generation have embraced this communication platform and it will be interesting to see how it evolves as handsets continue to improve and make it easier to send texts or written messages. In reading your comment, it makes me wonder if tech savvy prospects are better qualified or just better quality residents? I know from our experience with leads coming from the Internet vs. drive-by/print we have found the prospects to be more likely to lease or just a better quality lead. We are more likely to close the sale off an Internet lead than one from another source. That being said, I wonder if the same will hold true with mobile tech savvy renters? There’s no doubt that right now the internet is where a lot of the focus is, but I also think it’s fair to say that mobile is being groomed as the Prince to the Internet’s King. The key difference in the value of mobile marketing vs. traditional drive-by/print is the ability to track the lead instantly and directly to the source for immediate follow-up and interaction. Additionally, reporting and performance monitoring can be taken to granular levels to ensure optimal performance. In other words, at the end of each month, mobile marketing will allow communities to know exactly how many leads came from their mobile marketing campaign AND how many of those qualified leads turned into a lease. Transaction data obtained through mobile marking will ultimately prove whether or not this type of media is effective, which has traditionally been a “gray area” of drive-by/print. Evidence thus far seems to indicate that mobile marketing is at least as effective as traditional or Internet media. We’ve had customers tell us that, for properties following best practices we’ve seen in the industry, leads from IRIO exceed “traditional” marketing methods and seem to convert to closes at the same or higher rates. So, as you can imagine, we’re pretty bullish on marketing via mobile. Thanks for adding some additional thoughts. Much appreciated. Just a quick note about iPhones. I agree that an "App for That" is not a great use of funds and that it is unlikely to generate sufficient ROI. However, I think that providing an iPhone optimized website (for both the property and the management company) would return a greater ROI. Creating a well-crafted iPhone web app is more than just a CSS overlay, it requires some understanding of how and why people will be researching your property in a mobile setting. I also think that while iPhones represent a <5% of mobile phone users, they not only comprise an outsize number of mobile web users, they are, in certain submarkets, likely to provide more than 5% of your prospects. In student markets, which have a high number of iPhone and Touch users, I would suggest that a web app would have a tremendous ability to promote awareness and useful knowledge about a community. In those cases, I think it is up to apartment professionals to provide the web designers with some context in shaping our online mobile presence. Will, thanks for stopping by to comment. Mobile will continue to evolve. I like your idea of creating a iPhone optimized website. So many companies just throw up a website and don't think about how it might look on different monitors, let alone, and iPhone. The web is going mobile, and when choosing a web designer I think it's critical today that they understand that.